I live a quiet life, very limited, with a small ‘reach’ in the daily routines in which I dwell. If it’s fall, winter, or spring, I go to work, go to church, go to small group, and come home, where I drink tea, read, nap, and commune with my cats. If it’s summer, I do all the above except go to work. 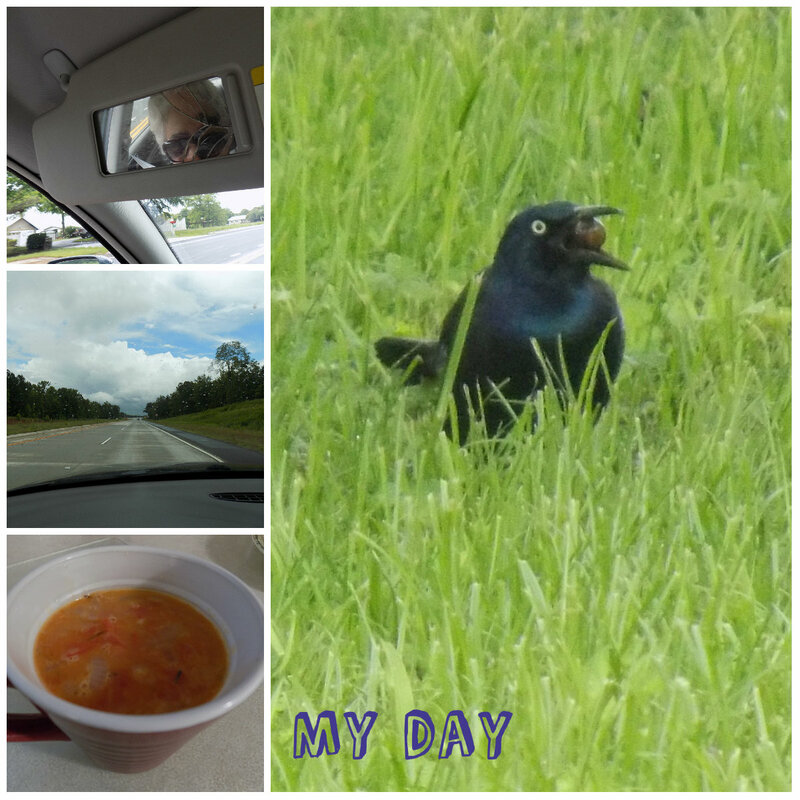 At the beginning of the summer I started a photo series called “My Day”. I knew that I’d have little to show, being that I stay at home 5 days out of every 7, rarely even emerging from the house to breathe fresh air. I started the series because I wanted to challenge myself in being creative with limited options. I kept it up for several weeks before the inevitable boredom and repetitiveness with it set in and I quit. I mean, how many collages can you make that show the same things: I ate a salad. Here’s my cat. This is the book I’m reading now. Coffee with whipped cream on it. Repeat. We should celebrate ordinary life. I am a fan or ordinary life, and using social media to show that ordinary life. This is for two reasons. 1. It’s a rebuttal to the fad of being “radical” that was sparked by David Platt’s book “Radical” where the prominent thread throughout the book was that if you’re not shedding American/Western consumerism and flinging yourself headlong into an inner city or a third world country somewhere for the Gospel’s sake, you’re a second-level Christian. Be radical, that’s where it’s at. John MacArthur rebutted the radical fad with an article I’ve mentioned and linked to many times on this blog. It’s called An Unremarkable Faith. It’s about a fictional high school chemistry teacher who goes to work, witnesses, loves his wife, repeat. The unremarkable (ordinary) Christian life is full of things that are not there. The cross word never spoken. The impatience never displayed. The ignorance never revealed. The ordinary life is full of restraint. It’s buttressed by mundanity. It’s filled with kindness, love, patience and all the fruit of a successful life in Him. The word ‘aspire’ in the verse as we read it in the ESV (philotiméomai) means I desire very strongly. Should we desire very strongly the celebrity life? No. Should we desire very strongly our best life now? No. Should we desire very strongly the quiet life? Yes. 2. I also esteem the ordinary life for a second reason that’s even more important than the first. It’s to honor the life described in the Bible. Since it was 1st century AD most people worked with their hands. There was no Wal-Mart to go pick up stuff. Paul was a tentmaker. I can imagine Dorcas/Tabatha sewing, Lydia making purple running her business. Simon the tanner. Fishermen. Very few lived the life of the mind. The Pharisees, notably, and scribes. Their and my greatest moment in life has already happened: salvation. What is there after that? Where else would we go? Jesus has the words of life. That word philotiméomai also means to seek after what is honorable. Living quietly, circumspectly, working at the mundane job, witnessing, demonstrating the day by day sustenance on His word, is honorable. We forget that. 3.This essay offers yet another reason to seek after the ordinary life. Our discipleship mostly consists, day in and day out, of following Jesus on some rather ordinary roads. … Something similar is true in our own lives. If we ignore or pass over the ordinary things of life, giving the highest honor to our best, most picturesque moments, we miss what life is really about. It’s hard to photograph the ordinary, but that is our life, most of us. It was the Bible people’s life, too. What would Simon the Tanner photograph and publish on Instagram if he could? Animal guts, blood, the kids running around, fixing the fence, sharpening the knives… His ordinary day. I suppose the jailer might post Kinfolk Aesthetic pics of his keys atop a pile of wood and artsy B&W pics of the jail bars in repeated shadow, lol. Dorcas: sewing needles and bolts of cloth and ladies sitting around. We think of the Bible people’s lives as ones of wielding swords in victory and shekinah glory all the time every minute, but most people’s lives for their whole life was ordinary and filled with quiet routines. We see our friend posting photos and making Facebook statuses of their fabulous trips. And there’s nothing wrong with that. I personally I enjoy all the family vacation photos I can see on Instagram or FB because they encourage me. But as the article The Instagrammable Christian Life makes the point, the high points aren’t the only part of life. Life is the ordinary, the quiet, the mundane. The article goes on to remind us that the Christian life also includes suffering. I’ll probably start up my daily collage series again but instead of My Day call it #OrdinaryLife. I’m also going to do a blog series called A Day in the Life of… and focus on the nuts and bolts of daily 1st century living for, say, a tanner, a merchant, a fisherman, a centurion, a jailer. Meanwhile, celebrate your ordinary life. If you’re a mom changing diapers, a laborer counting widgets on assembly line, a nurse cleaning up a mess, it is OK. This is what God ordained in our quiet lives. We just plug along in our ordinary routines, exalting God in the big and the little. Repeat. Our real life gets really REALLY good after we die. It will be our best life then. love the ordinary life, love reading about your day also, makes me appreciate life in the slow lane.